1. Link Building 2. Site Content 3. Advertising 4. Marketing 5. Viral Marketing 6. Affiliate Marketing 7. 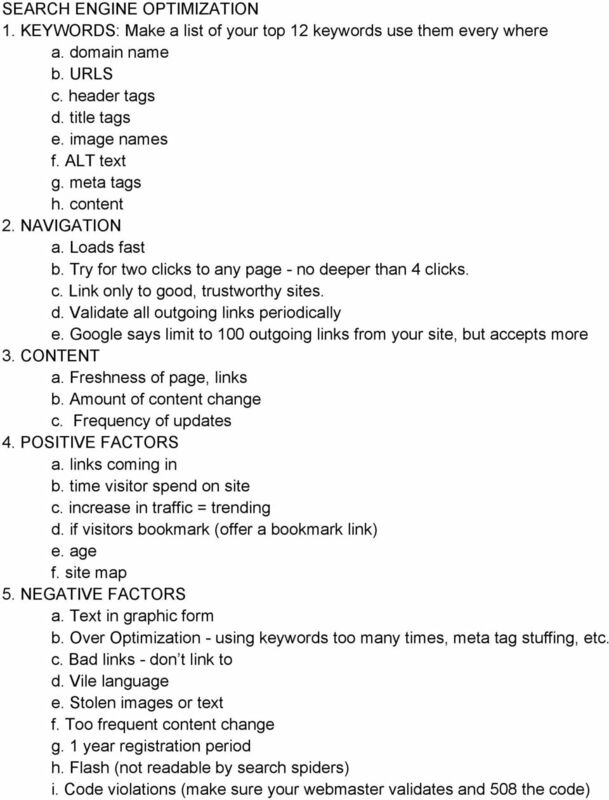 Search Engine Optimization 8. Download "1. Link Building 2. Site Content 3. Advertising 4. Email Marketing 5. Viral Marketing 6. Affiliate Marketing 7. 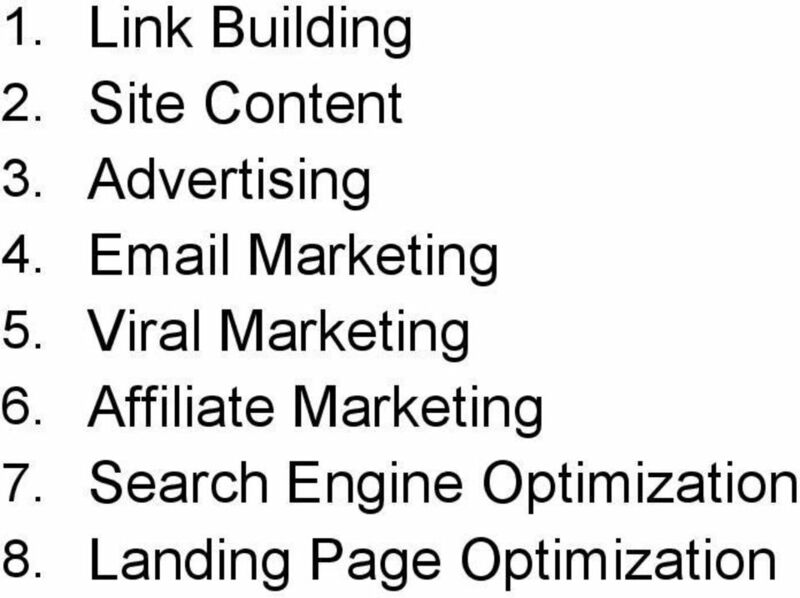 Search Engine Optimization 8." 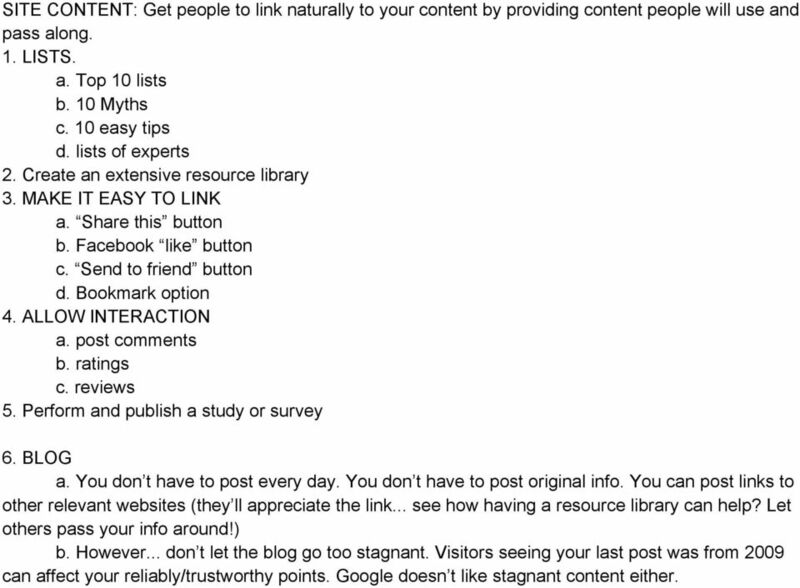 3 SITE CONTENT: Get people to link naturally to your content by providing content people will use and pass along. 1. LISTS. a. Top 10 lists b. 10 Myths c. 10 easy tips d. lists of experts 2. Create an extensive resource library 3. MAKE IT EASY TO LINK a. Share this button b. Facebook like button c. Send to friend button d. Bookmark option 4. ALLOW INTERACTION a. post comments b. ratings c. reviews 5. Perform and publish a study or survey 6. BLOG a. You don t have to post every day. You don t have to post original info. You can post links to other relevant websites (they ll appreciate the link... see how having a resource library can help? Let others pass your info around!) b. However... don t let the blog go too stagnant. Visitors seeing your last post was from 2009 can affect your reliably/trustworthy points. Google doesn t like stagnant content either. 4 VIRAL MARKETING 1. 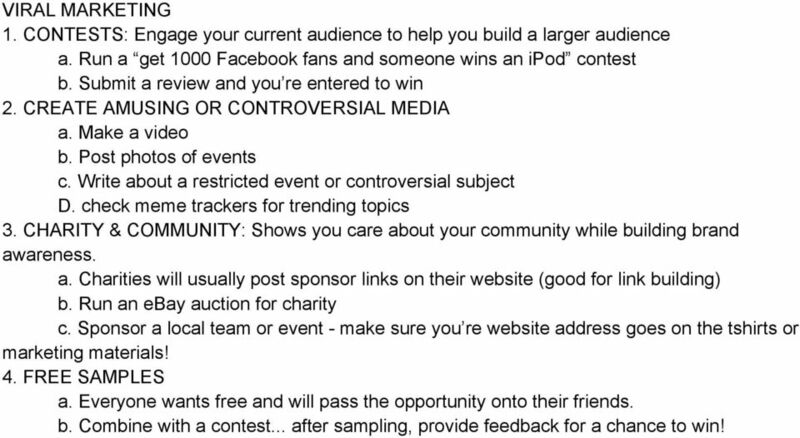 CONTESTS: Engage your current audience to help you build a larger audience a. Run a get 1000 Facebook fans and someone wins an ipod contest b. Submit a review and you re entered to win 2. CREATE AMUSING OR CONTROVERSIAL MEDIA a. Make a video b. Post photos of events c. Write about a restricted event or controversial subject D. check meme trackers for trending topics 3. CHARITY & COMMUNITY: Shows you care about your community while building brand awareness. a. 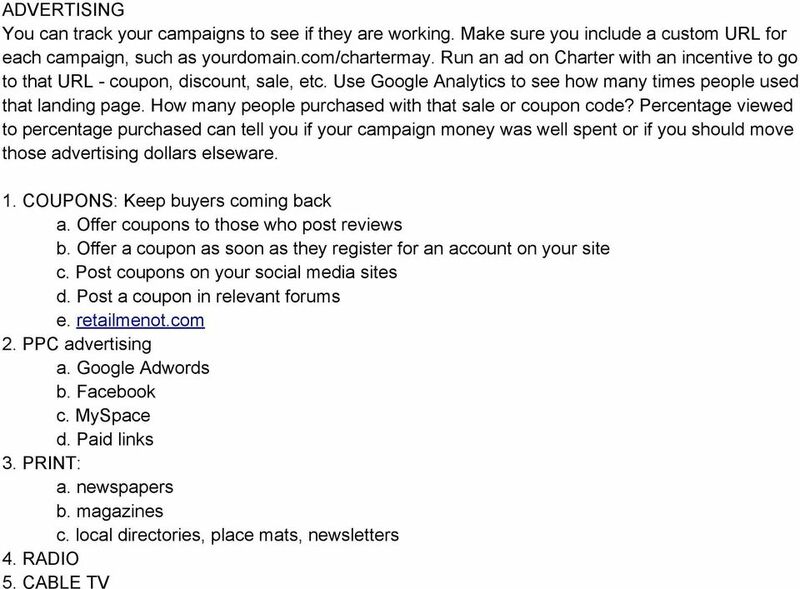 Charities will usually post sponsor links on their website (good for link building) b. Run an ebay auction for charity c. Sponsor a local team or event - make sure you re website address goes on the tshirts or marketing materials! 4. FREE SAMPLES a. Everyone wants free and will pass the opportunity onto their friends. b. Combine with a contest... after sampling, provide feedback for a chance to win! 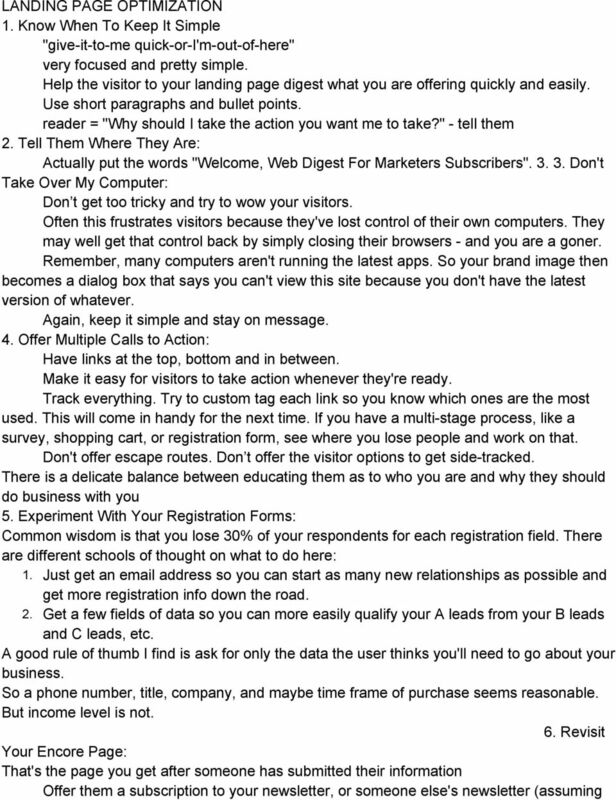 10 that other newsletter does the same for you) or give them an incentive to take a survey. Or try to upsell them or cross sell them. Don't just stand there, do something. 7. Take Nothing For Granted: What's obvious to you is not so obvious to other people, especially when they are from another company or a different part of the world. Repeating something for purposes of clarity is usually appreciated 8. 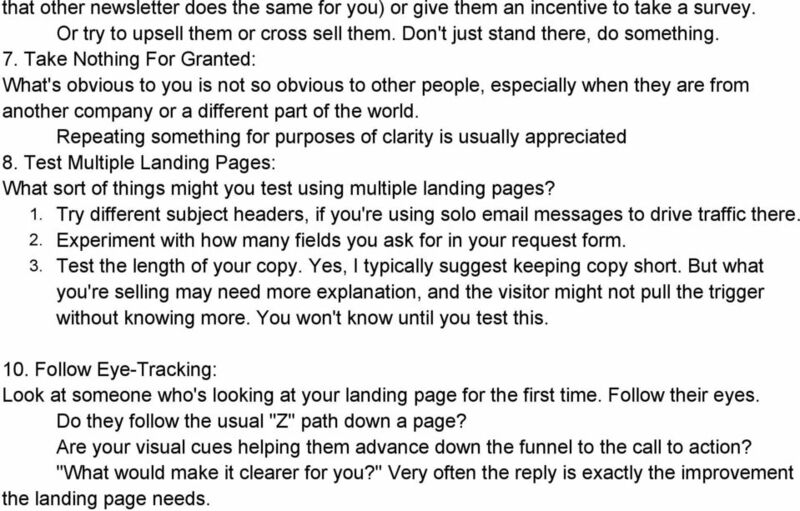 Test Multiple Landing Pages: What sort of things might you test using multiple landing pages? 1. Try different subject headers, if you're using solo messages to drive traffic there. 2. Experiment with how many fields you ask for in your request form. 3. Test the length of your copy. Yes, I typically suggest keeping copy short. But what you're selling may need more explanation, and the visitor might not pull the trigger without knowing more. You won't know until you test this. 10. Follow Eye-Tracking: Look at someone who's looking at your landing page for the first time. Follow their eyes. Do they follow the usual "Z" path down a page? Are your visual cues helping them advance down the funnel to the call to action? "What would make it clearer for you?" Very often the reply is exactly the improvement the landing page needs. IS YOUR BUSINESS OPTIMALLY EQUIPPED TO MAXIMIZE YOUR RETURN ON YOUR INVESTMENT? 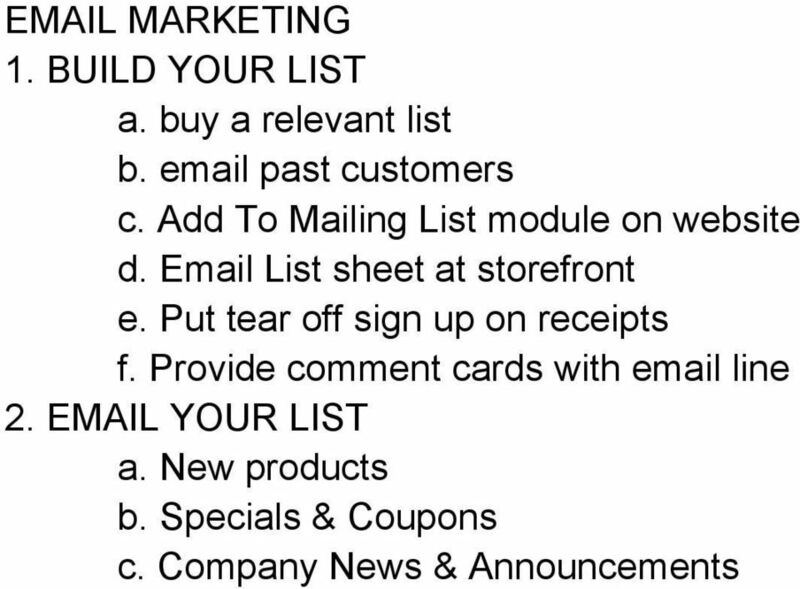 80 Point Business Marketing Checklist No matter what the size of your business, marketing is what helps you take your product or service from inside your company and deliver it to potential clients/customers.